If you fancy yourself as a spy in town for a covert operation in true Mission: Impossible form, then you might enjoy this. 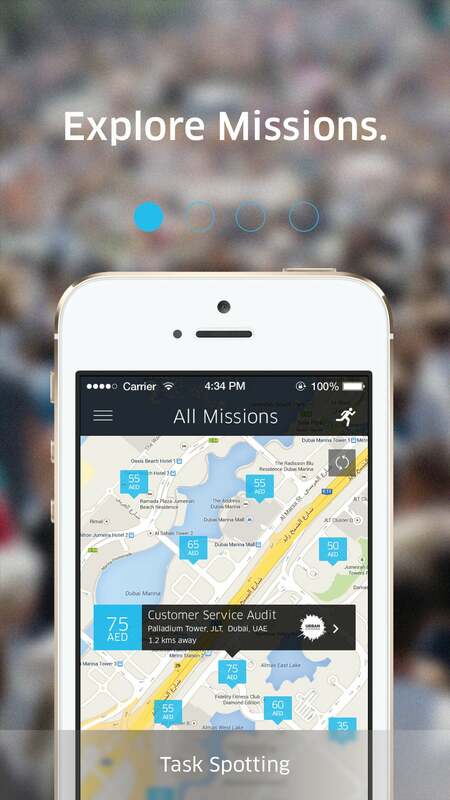 Launched in June 2014 at ArabNet’s Digital Summit, TaskSpotting is an app that lets smartphone users look for "missions" in nearby locations using GPS for companies seeking data collected by the end-user. With 300 missions online so far, each mission lists tasks to places consumers frequent. Some interesting (and relatively easy) ones that we noticed? Shawarma tasting, checking out car prices by taking pictures, or by answering questions- all activities that allow the task spotters to earn cash rewards. Yes, you read that right- "Spotters" actually get paid via PayPal or exchange centers. As Dubai and Abu Dhabi joins the list of most expensive cities for expats in the Middle East and the costs of living get much higher, people can look to TaskSpotting for a way to gain a little extra cash legally. Starting with an idea to develop an effective way for businesses to get real-time visibility and market insights, the TaskSpotting team asked companies what they needed in terms of data, and their results indicated that speed and quality were top areas of interest. Bringing this need and technology to smartphones was the next step. “Imagine being able to reach out to thousands of consumers, ask them for the information you need from the market and receive it back accurately and in real-time, all at the touch of a button,” says Karim Aly, the startup’s CEO and co-founder. With a background in investment and strategy, the 35 year-old INSEAD MBA grad is no newcomer to the ‘trep scene, having seven years under his belt with his previous company Ecobility, which was ranked as “#1 SME in the UAE” by AllWorld Network and also as “#1 SME in Dubai” for both financial performance and overall growth by the Dubai Economic Department. Joined by Aly is Dirk Stevens as Head of Business Development and in-house life coach, a veteran in enterprise software sales and an INSEAD MBA graduate. Stevens previously handled regional business development at Advent Software. TaskSpotting’s Head of Operations, Walid Sherif, graduated from American University in Cairo, and has a commodity trading background. Bootstrapped by the founders from concept to realization, the app is breaking the state of how companies coordinate market research. For the UAE, it’s the first app that pays users with real cash, and the first platform in the UAE and Middle East to utilize crowdsourcing to get real-time business info from the consumer’s perspective. Why did they decide to use crowdsourcing? Efficiency. Although data accuracy and relevance is still very much a priority, some may argue that gone are the days when companies relied on traditional research firms- they can receive information in days, rather than weeks. The platform combines crowdsourcing with mobile tech, “by allowing businesses to capture information from precise locations, in real-time by leveraging smartphone users.” Plus, with the smartphones today, businesses can also increase their insights using photos, videos and audio to enrich the Spotters’ answers. The possibilities of how it can be used are endless, but for now the most common angles are “retail execution audits, competitive intelligence surveys, and mystery shopping.” It’s quite a playground for businesses to look for virtual workforce too, with Aly coining it as an “outsourcing marketplace.” Except in TaskSpotting’s case, businesses are considered “clients” needing “real-time insights,” while “freelancers” are onsite customer survey-takers using an app. An impressive feat, considering how it brings the two to collaborate using a tool such as TaskSpotting. TaskSpotting founders (left to right): Head of Operations Walid Sherif, CEO Karim Aly, Head of Business Development Dirk Stevens. Image credit: TaskSpotting. How is it different from virtual assistant platforms? Quite different as matter of fact, wherein virtual assistant platforms make use of C2C (customer-to-customer) business models, whereas TaskSpotting is a B2C (business-to-consumer) stand. Although commending the well-proven business model and an easier tactic to execute, Aly dreams of a more “ambitious” platform. “We wanted to solve a real business issue and disrupt the status quo by harnessing the powers of mobile technology.” Disrupt the status quo, indeed. It seems to have attracted a warm welcome to its user base too, with word of mouth being their key catalyst that brought more than 2000 Spotters and other markets from the MENA region asking when missions will be live in their cities. Their early adopters are mostly “stay-at-home moms, cabin crew, teachers, retail professionals, and college students”. TaskSpotting is an app that essentially trusts users to do tasks, what were the challenges of convincing users and businesses of its functionality? How were prospective users and companies convinced and guaranteed payment? Aly admits it may seem as a “too good to be true” concept, which is why they were initially met with skepticism. But the team squashed naysayers via demonstrated results– and it worked. With businesses, Aly counts themselves as fortunate for having “willing” partners at launch, pleased with TaskSpotting’s quality, speed and accuracy. In terms of Spotters, “we had a few enthusiastic Spotters who took a leap of faith on us by being the first to complete missions.” After earning their cash rewards, word spread around the community with one Spotter couple earning over AED1000 for completing missions over the course of a weekend. “I think it’s safe to assume that they’ve now become two of our biggest brand ambassadors,” says Aly. Every startup faces roadblocks, and TaskSpotting has definitely had their share of hurdles. “I won’t sugar coat it- it was very, very challenging.” During the development and testing stage, their resolve was pushed to the edge: “Every line of code has implications on the entire infrastructure so the development phase involved a steep learning curve for us and required months of testing to get it to where it is today.” Their process will “continue to evolve” from days of bootstrapping the company “to the tune of US$200,000” to currently having prospective investors –initiated from the investor’s side, a humbling and proud moment for Aly- and finally to launching at ArabNet that provided them more opportunity for exposure and networking, they’ve come a long way. After nine months in development and their recent launch in the UAE proving to be positive from both sides of the market, TaskSpotting is more confident. What’s next for TaskSpotting? Post launch, the team has thus far been pleased with the results and feedback. They do have plans for “evolution and enrichment”, but it’s less about their “vision and more about a process of discovery.” For now, they want to reflect and gather more feedback “before we embark on a specific strategic plan”, adding how they want to “create value” for both businesses and Spotter communities.